We’re nearly there, folks! The New Story Festival is just over a week away, March 29th-31st. Join us in Austin, Texas together with speakers, teachers, and performers experienced in reflecting on the stories we tell, activists engaged in the courageous work of social transformation, spiritual leaders pointing the way to a rich inner life, artists and musicians on the leading edge of creativity in music, painting, writing, and more. "I've never heard of, seen, or attended a festival like the New Story ever, in my many years of touring and playing. This is ground-breaking, something new, and something really hopeful. We could all use that, right? Find out about all of this and more in our beautifully designed print program - now online to view or download. With descriptions of over 100 sessions spread over 9 simultaneous venues, you really have to see it to believe it! Find out what’s waiting for you at the New Story Festival - music, workshops, mind-expanding conversations, quiet reflection, a better world. Our tickets are available at different price levels - starting at only $49 for Day Passes and $99 for the entire weekend - but everyone gets the same thing in return. We ask only that you pay what you can afford. That’s right - look at the ticket options, and opt in at the level that works for you based on three simple questions: 1) the resources you have available, 2) your desire to support the launch of this beautiful but fragile endeavor, and 3) a sense of mutual respect and fair exchange. You are part of the New Story community - we need your support to thrive. Register now - Like Carrie Rodriguez said - you may never have been to a festival like this one before! Come let’s break some ground together. But that’s more than a nice idea - it’s a truth about our reality: the world doesn’t have to wait for the story - or the rules - to change before it does. Instead, we can bend the rules (especially the unjust ones), and experiment with a new story before we’re even sure where it might lead. In imagining just what it means to say that the best criticism of the bad is the practice of the better, there are three practical steps we want to suggest. You might want to try one of these steps each day, and after three days, try one again! 1: Everyone has a part to play in the new story - when you meet someone you don’t know, perhaps at the checkout or on the bus, or in a parking lot or at the gym, try to imagine them being part of the new story of creativity, community, and the common good. If you get the chance to say hello, talk to them while imagining that although you may never see each other again, you’re part of an immeasurably huge “Us”, not “Them”. 2: We are invited to step beyond fear and separation into enacting hope and connection - consider stepping away from fast-moving media sources, even for one day each week, especially TV news, and online sources that are constantly updated. Instead, consider a project to care for or renew local community and ecosystems - volunteer at a soup kitchen, or a neighborhood cleanup - what matters is to be physically present with other folk doing good in the world. 3: Nobody knows what's going to happen tomorrow - so let us live the world we want to see today… - all the great wisdom traditions invite us not to worry about tomorrow, for today has enough problems of its own. Better than that - they also suggest that loving ourselves is as important as loving our neighbors. So consider the following practice: every time something fearful comes to mind, name out loud five things for which you are grateful. And see what happens. There are, of course, thousands of ways to live the New Story - the three above are just the ones I’m thinking about today. I’m so delighted that we’ll get the chance to discuss, experiment with, and live the New Story together in just a couple of weeks. If you haven’t registered yet, now is the time to do so - there are plenty of options to make the festival widely accessible at a range of ticket prices; you can come for an evening, a day, or the full three day celebration of community, spirituality, and social action. We as organizers of the New Story Festival are committed to the work of building a fairer world of connection, courage, creativity and the common good. Some of our team have been deeply involved in peace-building, reconciliation, and seeking common ground. The New Story is taking place in the context of a divided society, with political polarization so obvious it has become a normal part of our everyday soundscape. But we don’t think that’s the end of the story - indeed, we wouldn’t be doing something called the New Story Festival if we believed that! There are at least five things the New Story will help us do that could reduce the divisions we currently face. Register for the festival and join us in the effort! 1: Listen to voices who hold the wisdom of indigenous traditions: from those who were here first. We’re honored to welcome, among others, Native American activists and teachers Kaitlin Curtice and Vance Blackfox. 2: Seek common ground for the common good. There will be opportunities throughout the festival to meet folk who see the world differently, listen to each other’s stories, and ask how we can help meet each other’s needs. One really cool example: InterFaith Youth Core is hosting two sessions on how we can relate with depth, insight, and respect across religious traditions. 3: Build relationships - the "Three Doors” idea. 4: Don’t assume you understand another person’s motivation until you have walked in their shoes. This is such a familiar teaching that it’s easy to ignore - but there’s profound truth here: stepping back from making judgements about other people’s motivation is a vital part of conflict resolution and relationship building. We seek to model that kind of space at the festival - come help us! The Irish poet Paul Durcan wrote that what God made us to do is to “enjoy ourselves”. That’s a pretty radical idea when it’s so easy to see the suffering of the world, or the challenge to make a better one. But we will burn out quickly if we don’t learn how to play. So wherever you are today, join us at the New Story Festival, where we’ll seek to embody all four of the ideas above, and have fun while doing it! Weekend passes are only $249, but we don’t want anyone to be turned away, so we offer Pay-From-the-Heart Pricing, starting at $99 based on your ability to pay. Children attend for free, Youth tickets are only $20, and Students of all ages can attend for only $70. Join us for an entire weekend of creativity, community, and the common good - speakers, musicians, workshops, dancing, connection, and action for a better world. We want to highlight just a few of our exciting festival program sessions: including Practicing Hospitality: Lessons from The Migrant Caravan with Gavin Rogers, who, just a few months ago, joined the caravan on its challenging journey; Original Blessing with Danielle Shroyer, who will share a better story of human nature than the one many of us were raised with; and festival co-founder Gareth Higgins will share Lessons for the U.S. from the Peace Process in northern Ireland. You can see the full festival schedule online. It’s going to be an amazing weekend, and we can’t wait to see you there. The New Story Festival has been named the signature festival of Compassionate Austin, a growing grassroots movement united to promote, strengthen, and celebrate compassionate action in Austin, Texas, and part of the global Charter for Compassion movement begun by Karen Armstrong in 2008. It's true! This growing global movement for compassion, activating people across the globe to restore compassion to the center of religion, morality, and politics is a hugely exciting and hopeful development - especially in these trying times that can too often seem lacking in this basic virtue. It's an honor to be adopted by Compassionate Austin and, together with them, we hope to help Keep Austin Compassionate! The New Story will be the backdrop for the launch of Compassionate Austin’s newest initiative, the Compassionate Austin Co-op- a self-identified collective of nonprofits, businesses, schools, libraries, faith communities, civic groups, social activists, and individuals committed to promoting “3D” compassionate action (caring for Others, Self, and the Earth). Anyone can join - both organizations and individuals. There’s no cost and Co-op Members are eligible for multiple perks, including free or discounted festival passes and half-price on festival exhibitor booths. The centerpiece of the Co-op is their Offers & Needs Market, also debuting at the festival. The Market is a 90-minute guided process where participants gather to identify and exchange passions, knowledge, skills, resources, and needs. Combining community asset-mapping with sharing-economy principles, the Offers & Needs Market has the potential to enhance the work of compassionate organizations and individuals in the Austin area exponentially - in very tangible and practical ways! All festival participants (not just Co-op Members) are welcome to participate in the Market - being held on Sunday, March 31 at 5pm. Take the Keep Austin Compassionate Pledge and then share it to Facebook & Twitter to encourage your friends to do the same. 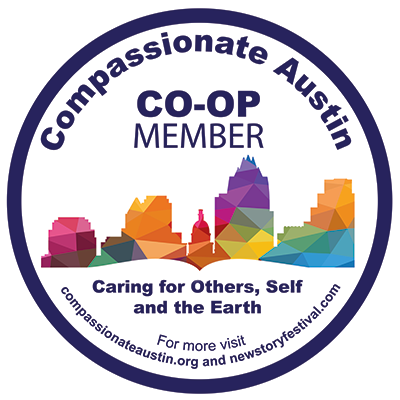 Tell your favorite charity, faith community, civic organization, or local business to join the Compassionate Austin Co-op and participate in the first-ever Offers & Needs Market at the New Story Festival. Buy your own festival tickets now and make plans to be part of the Offers & Needs Market yourself! At the New Story Festival you can hear world-class musicians like Over the Rhine and Carrie Rodriguez, listen to internationally respected leaders like Nadia Bolz-Weber, Brian McLaren and angel Kyodo Williams, participate in workshops about building beloved community or developing leadership styles that promote the wellbeing of all, be led in life-affirming meditations or spiritual direction, and much, much more. Sara Ness, Jordan Myska Allen, and Scott Gregory. Sara, founder of Authentic Revolution, one of our key festival partners, will be hosting our Connect program venue and leading multiple sessions on how to authentically relate as humans. We're delighted to welcome her wisdom to the festival. Jordan, co-instigator of Circle Anywhere, will be bringing the beautiful practice of Circling - a path of immediate self-awareness, breakthrough potential in relationship and a deeper relaxation and thriving in groups. 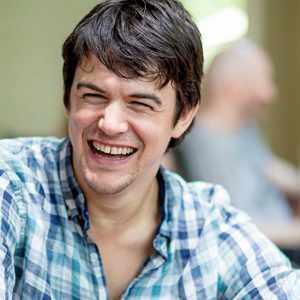 Scott, co-founder of Present Company, will be facilitating Authentic Relating Games - a collection of extensively tested, masterfully led experiences that give players a hands-on taste of both the joy and skills of interpersonal connection. Wanna have fun and connect with yourself and others at the same time? Register now - these practices are truly revolutionary; your life might never be the same! As a majority white organizing team creating a multi-cultural event on the campus of an HBCU, we have accepted the sacred charge to recognize and dismantle racism in ourselves, our festival team and the spaces we create. We’re hosting a conversation at the festival called Towards Beloved Community: Connection & Accountability in Healing Racism - and this conversation is so important, we'd like to invite you to get started early. bell hooks says "If we want a beloved community, we must stand for justice, have recognition for difference without attaching difference to privilege." Part of this means that people who occupy places of privilege in our society have a responsibility to reflect on and dismantle the ways in which we perpetuate racism. Join us in this sacred task. On March 14th, at 7PM CST, we’re hosting a conference called facilitated by Micky ScottBey Jones and K. Stellar Dutcher, the festival MCs. During this call we’ll explore some basic white cultural norms and our relationship to them, learn more about how we unconsciously perpetuate racism and the harm it causes both ourselves and others, and lay some basic groundwork for engaging as an ally or accomplice in racial justice work. We will do this through lenses of compassion, connection, love, and the spirit of healing. If you are new to multiracial spaces, or if you are curious about why this call is necessary, we especially invite you to join us. Information on the Zoom call is below. If you’d like to begin or continue your journey with this work right now, you can peruse our handouts on white culture and microaggressions, or read Micky’s beautiful poem Invitation to Brave Space. For more information on the call or these topics, you can email stellar@newstoryfestival.com. What if the problems we face could be overcome by changing the story we tell? The current global crisis is a crisis of storytelling - it’s not the world that’s falling apart, but the story we’re telling about it. If we become inquisitive about our stories, asking how they serve a vision of the common good, whether they are true or helpful, we can change our underlying narratives and the world around us. It really is that simple. What if the painful past could be turned into energy that helps create a better future? One reason we started the New Story Festival was to resource communities seeking a better world - especially faith communities! Our festival at the end of March is designed to do just that: (1) come as a group; (2) choose from over 80 different artists, activists and teachers the sessions that feel most relevant to your community’s current needs; and then, (3) be in conversation together about how to bring those ideas home with you. What if we could gather as individuals and communities, and make a path beyond despair to empowered hope? In one weekend we’ll help you connect with people who want a better world, ideas to inspire positive action, and a path forward for your community to become what you always dreamed. If you’re anxious about the world, you’re not alone - but a new story is being born. Join us for one weekend, find new friends, ideas that liberate, and a path to transform your life, your community, and your neighborhood. There’ll also be a special area for HEALING ARTS, from spiritual directors to Reiki, massage, nutritional counseling, and even a birdsong meditation. Find out more here. Mike Clawson presenting at the February 7 Austin City Council meeting to announce the Compassionate Austin Co-op and the New Story Festival. The key activity of Compassionate Austin Co-op members is to participate in an Offers & Needs Market - a 90-minute guided process that combines community asset mapping with sharing economy principles to enable all participants do the work of compassion more collaboratively and effectively. The first Austin-area Offers & Needs Market (and the first Market ever done on a city-wide scale!) will be held on Sunday, March 31, at the New Story Festival! Any and all festival attendees are welcome to participate. Join the Co-op by filling out this form (or this one for organizations) and then get your festival tickets here! Our friend Richard Rohr taught us, and it seems to be a universal law: because oppositional energy always recreates itself, we have to find ways to challenge what isn’t working by replacing it with what can. And so our teachers, artists, musicians, workshop leaders, connectors and volunteers are all committed to embodying the heart of this idea. We want to apply that thinking to the festival too. What needs to change about festivals? Think about it for a moment - we go to festivals, we may hear brilliant ideas, participate in stimulating workshops, make meaningful connections, and then we just go home. No bridge is built to our everyday lives, and the festival magic can easily recede into memory. But the New Story Festival is attempting something different: we want the ideas and experience of creativity, community, and the common good not just to be enjoyable on the weekend, but to make a difference in our lives and in the world. It’s not a spectator sport - while you’ll get to hear brilliant ideas, music, and contemplation, the main thing is to take the ideas and the connections you’ll have made home with you. There’ll be lots of time and space to connect with people like you - who care about humanity, care for the earth, and want to live lives of courageous love, for the common good. If you’re part of a church or other spiritual community, if you work with a team seeking to make a better world, or even if you haven’t found your people yet, the New Story Festival could be the place you find your next step. And if you have ideas to make it better, we’re ready to listen too! We’re bringing a full weekend at the intersection of community, creativity, and the common good to Austin at the end of March, and we’re happy to announce that the New Story Festival Schedule is available now! There’s more to come, but right now you can see over 70 sessions - talks, concerts, workshops, and creative happenings, running from Friday evening to Sunday night, March 29th-31st. There will be lots of amazing things to listen to and think about - but you’re invited to be more than just an audience: the New Story Festival is a place for you to bring yourself, your friends, your team, and your community to imagine how you will take the vision back to your community. Don’t have a community yet? We’re ready to help you find one - come to the New Story Festival and it won’t be long before you connect with people you think, live, love, and care like you do. There are lots of reasons to join us, but we’ve picked five particular ones, and we think you’ll agree with us. Hear wise and life-giving teachers like Brian McLaren, Rev angel Kyodo Williams, Charles Eisenstein, and Nadia Bolz-Weber, who will talk about her new provocative and healing book Shameless. After hearing Nadia you can gather with your community to discuss how to make brave spaces for healing the unnecessary shame most of us have experienced. Find a new self-image, transcend your wounds, and live better. Experience Authentic Relating Games - a brilliantly accessible way to take life seriously without taking ourselves too seriously, learn about how to transform your organization - whether its a church, a school, a business, an activist movement, or even a circle of friends through the revolutionary Holocracy leadership style, or the beauty of Circling, where anyone can find a mirror for their greatest hopes, and support for the most difficult challenges. Attend the Offers and Needs Market, where people who care about where they live will show what they can give, and the resources they need to make our towns, cities and countryside places of peace, renewal, and wholeness for everyone. It's a perfect way to start reimagining your hometown, wherever you live. Be enveloped by the magnificent soundscapes of the music of Over the Rhine, Carrie Rodriguez, and Riders Against the Storm; and then maybe write your own music - with new and old friends - poetry, prose, visual art are all welcome too. Finally, whether you’re dancing at the mainstage, taking notes in the Ideas session about how to make the economic system more humane or even sacred, lessons for the US from conflict resolution process elsewhere, or connecting across lines of political difference at a People’s Supper, the New Story Festival will be a unique opportunity to ask yourself how to change your life so that you use your gifts and power for the common good, and find a space where you can get the help you need. Find out more at the festival website, where the schedule has just been posted here. These days, it’s easy to find stories of despair or what’s not possible. The New Story Festival exists because some of us - imperfect activists, artists, community members who want to make a difference, rather than just allow the world to happen “to” us - know that we need a better story. We need you there too. Join us - make the new story yours, take it back to your community, and your lives may never be the same again. Pastor and New York Times bestselling author Nadia Bolz-Weber joins Gareth Higgins, co-host of the New Story Festival, for a fascinating conversation about adult topics with an entertaining tone, presented with love! Hear Nadia in person, and many more fascinating, creative, open-hearted and courageous storytellers, activists, and teachers, at the New Story Festival, taking place March 29-31, 2019, in Austin, Texas. Early bird tickets are just $179 now thru December 31st! Learn more and get your early bird tickets online now. 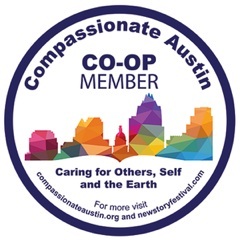 The New Story Festival has been named the signature festival of Compassionate Austin, a member of the Compassionate Communities campaign of the global Charter for Compassion movement! 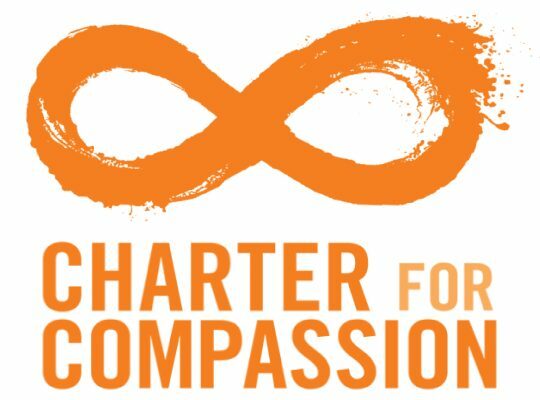 Begun by Karen Armstrong in 2008, Charter for Compassion exists to activate people across the globe to restore compassion to the center of religion, morality, and politics through collaborative partnerships and concrete, practical action. The New Story Festival is the Signature Festival of Compassionate Austin! We invite everyone to come together for community, creativity, and the common good. Believing that “the best criticism of the bad is the practice of the better,” the New Story Festival seeks to lead us into a better story – one that encourages growth and liberation, healing and harmony; a story where the downtrodden are uplifted and everyone is included. Artists, activists, teachers, practitioners for spiritual/emotional health & wholeness, along with numerous other social innovators gather to share their creativity, practices, and stories. The New Story Festival is a bold experiment for a better world, embodying imagination, spirituality, social action, and playful connection – defined, above all, by the practice of love. The festival is a community-wide celebration, inspiration, and activation of “3D” compassion: caring for others, self, and the Earth! Members of Compassionate Communities from across the state of Texas and representatives from the global Charter for Compassion will be gathering together at the New Story this March to connect and coordinate with one another as they enjoy the broader festival as well. We hope you'll join them there! Get your Early Bird Tickets for only $179 (now thru Dec. 31st!). The First Lineup Announcement for New Story Festival 2019! People live by stories, many that we're often not even aware of. Some of our stories hurt more than help. Stories of separation, selfishness, scapegoating, and the avoidance of suffering are ready to be replaced by stories of creativity, community, courage, and the common good. The New Story Festival will gather people to experience -- and help build -- a better world by shaping and sharing a better story. It will be deep but not boring, playful and fun without avoiding hard questions. Come help make a world of compassion, peace, and welcome -- we'd love to see you there! The inaugural New Story Festival takes place March 29-31, 2019, in Austin, TX. We are delighted to announce the festival lineup below -- spiritual teachers leading us into the future and beloved Americana musicians, radically inclusive storytellers and Irish peace activists, trauma healers and provocative teachers -- bearers of a better story are coming to Austin. Come add your story too! 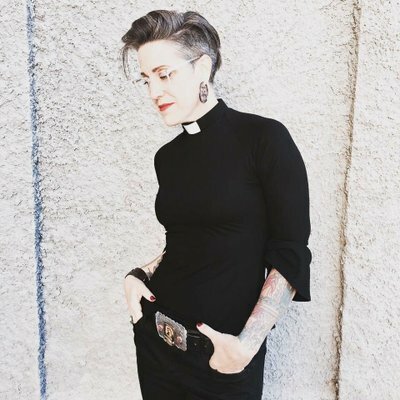 Nadia Bolz-Weber is a two-time New York Times best-seller, Lutheran pastor, and author of the new book Shameless: A Sexual Reformation. Called “the most intriguing African-American Buddhist” by Library Journal, Rev. angel Kyodo Williams is an author, maverick spiritual teacher, master trainer, and founder of the Center for Transformative Change. According to Publisher’s Weekly, Charles Eisenstein “will be noted in antiquity as one of the seminal and pioneering storytellers of this new world.” His latest book is Climate: A New Story, and we’re glad to call him a friend of the New Story Festival. Austin-based “Ameri-Chicana” singer-songwriter Carrie Rodriguez is known for her passionate performances, effortlessly melding fiery fiddle playing, electrifying vocals, and a fresh interpretation of new and classic songs. Beloved Americana musicians, Linford Detweiler and Karin Bergquist are acclaimed together as Over the Rhine. They “create spaces where good things can happen,” and the New Story Festival will certainly be that. 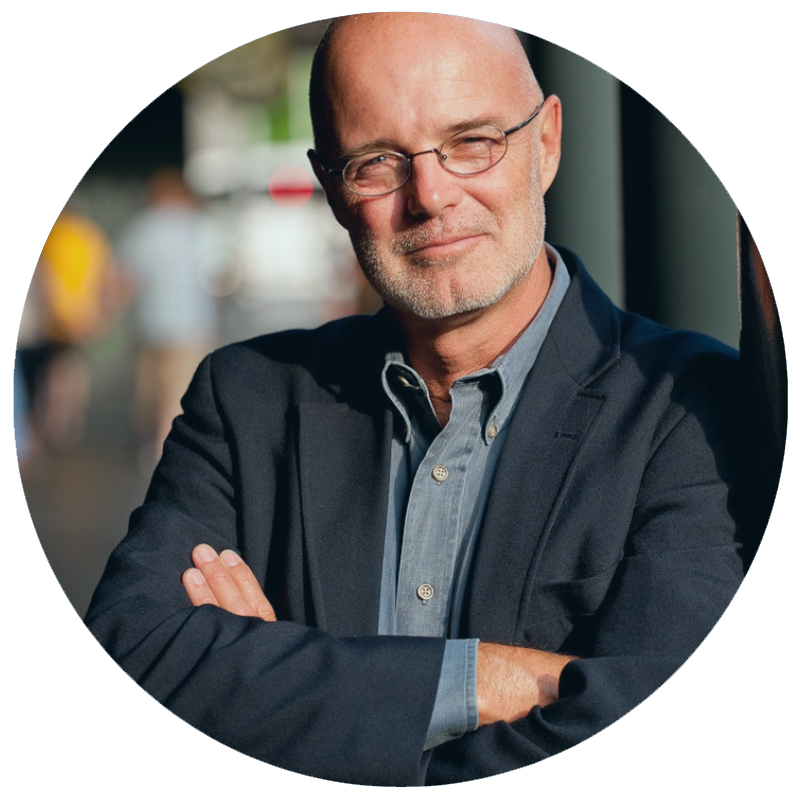 Activist and author Brian McLaren is co-creator -- along with New Story Festival co-host Gareth Higgins -- of The Seventh Story book and its companion children’s book, Cory and the Seventh Story. 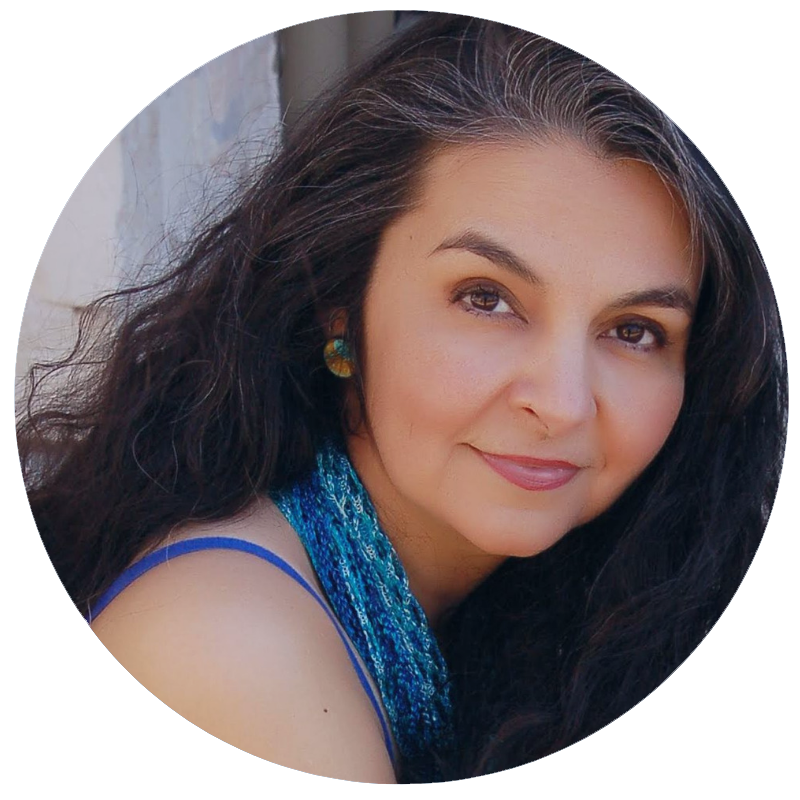 A native Texan and acclaimed performer, Amparo Garcia-Crow is a multi disciplinary artist who acts, sings, directs and writes plays, screenplays, and songs. Amparo was with us for the one-day New Story Experience, and we're thrilled she is coming back for the full three-day festival in March! Over 60 other speakers, facilitators, performers, artists, and dreamers will join these headliners to help lead us toward a better story -- one of compassion, reconciliation, and collective liberation -- making better lives for a better world. How do we do this? Spend a weekend with us in Austin this March, and you'll hear provocative wisdom, discover new tools for authentic community, be surprised by art and activism, engage in playful fun and frivolity, and find your own place in the New Story. The New Story Festival is for all ages -- we will have exciting, transformative programming for kids and teens as well as adults -- so bring the whole family! Early bird tickets are just $179 now through December 31st! We have multiple ticket price options for folks at all levels of financial means, including FREE! (Volunteer with the festival and a get a full weekend pass in return.) We also offer discounts for groups of three or more, and even bigger discounts for groups of ten or more - so gather your crew and register now! If you can't make it for the whole weekend, we also offer day passes, just purchase the pass that works best for you. Any questions? Contact us at info@newstoryfestival.com. Join us March 29-31, 2019, in Austin, Texas, for the first-ever New Story Festival - we hope to see you there! Get Your Early Bird Tickets Now for New Story Festival 2019 - only $179 thru December 31! On the latest episode of the New Story Festival Podcast, justice doula and New Story Experience presenter Micky ScottBey Jones speaks with festival co-host Gareth Higgins about how the New Story reminds her of the African idea of sankofa, the importance of allowing ourselves to dream, and how a festival is an opportunity to practice a different way of being together. Hear more from both Micky and Gareth at the New Story Experience, Saturday, November 3 at Huston-Tillotson University in Austin, Texas. Tickets are now $10 and up.